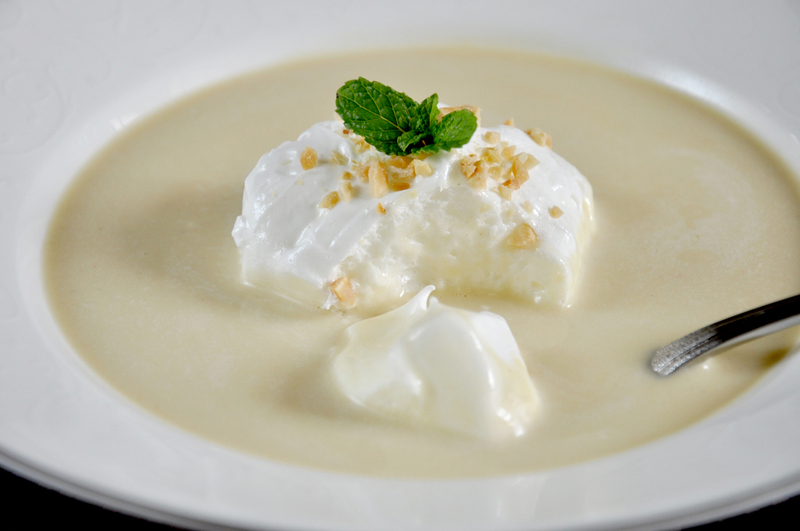 Light dollop of fluffy meringue floating on creamy durian soup. I never had the classic French dessert ile flottante (floating islands) until a visit to Luxembourg last year when I was invited to dinner by French Chef William Mahi. William's ile flottante was so good that I unbashedly had a second helping and would've had a third if I didn't control myself. 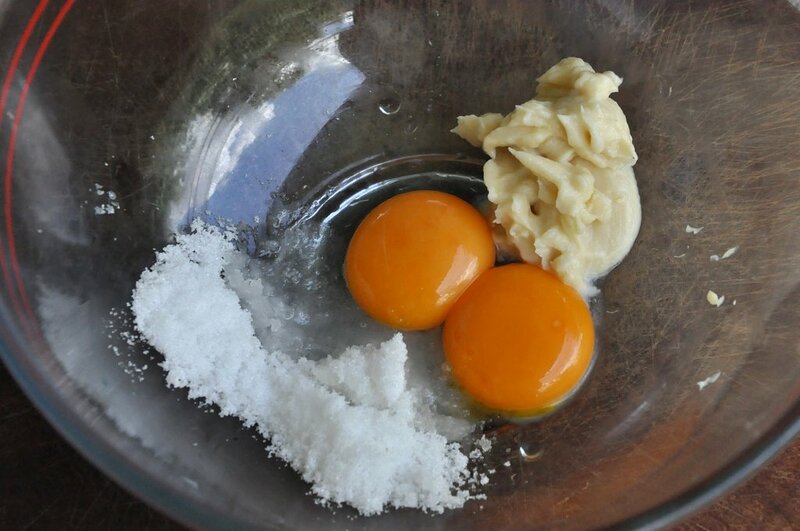 I've been wanting to make this dessert ever since but was intimidated by its "Frenchness". Now that I've done it, I must tell you: it's darn easy to make! Durians have just come into season here in KK, about 2 months late this year. Prices are ridiculous, ranging from RM15/USD5 to RM30/USD10 per kg. Since most of the durian's weight is in the shells and seeds, each seed of durian can work out to RM7/USD2.30 to RM10/3.30! But durian lovers are willing to pay for this most loved and hated fruit, even if it means going hungry until the next paycheck. We were at the durian stalls yesterday and as usual, groups of people were milling around the durian trucks choosing and bargaining for the King Of Fruits. While durians are best eaten with family and friends, we saw a lady seated alone, eyes half-closed, durian seed and fingers to her mouth. That's when I realized that the pleasure of eating durians is almost sensual. No other fruit has that effect. 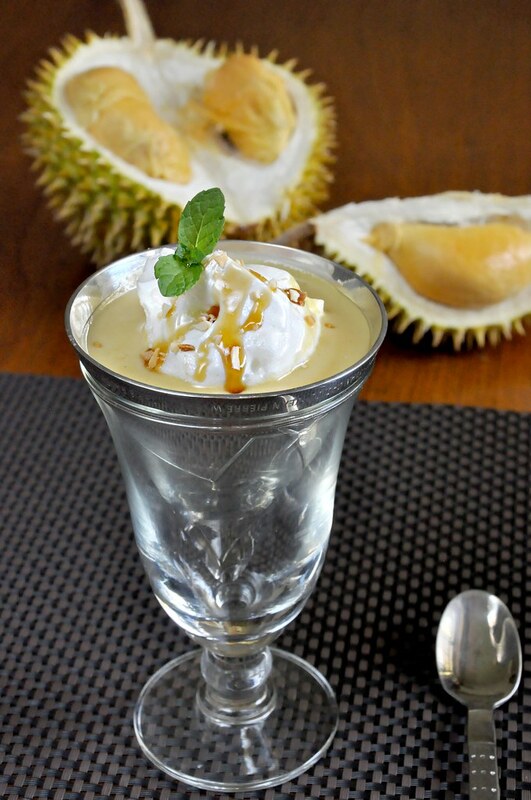 I've adapted the ile flottante recipe from here, reduced the sugar, omitted the salt and replaced the vanilla with durian. 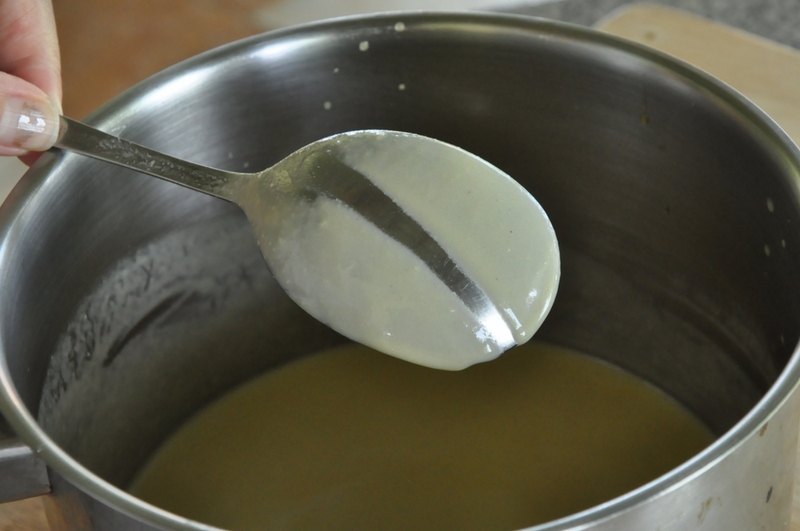 I increased quite a bit of the milk because I like the creme to be thinner--the creme is eaten with a spoon like a soup. I tried scalding the meringue puffs in hot milk and then baking them in a cool oven for 15 minutes as per the recipe but found that they tended to break off in the hot milk so what I did was just baked the puffs straightaway. It worked fine. The meringue puffs should not be browned or crusty as in pavlova meringues. They should be tender, easy to cut with a spoon and meltingly soft in the mouth. 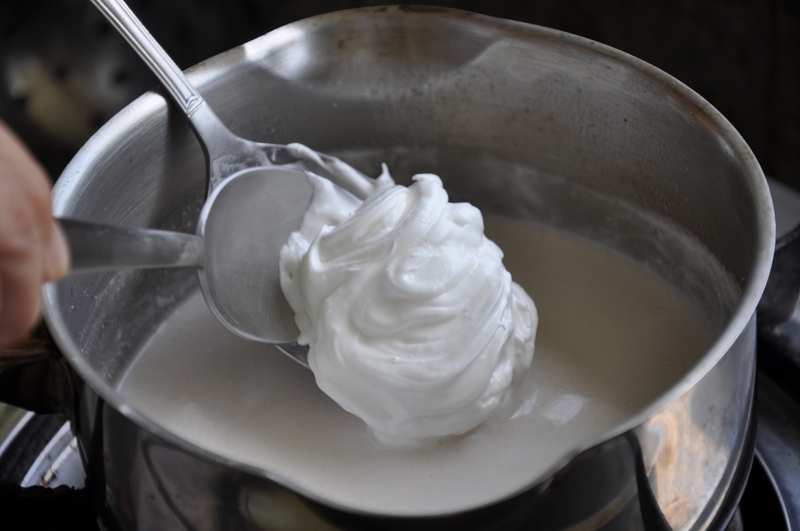 For such a simple, elegant and delicious dessert, the creme must be light, to go with the delicate frothy 'islands'. It has to be smooth too and the ingredients must be the best and at their freshest. That means only the best vanilla beans will work for this dessert. The durian creme can be overly rich so I think the coconut milk can be replaced by ordinary milk since the durian overpowers it anyway. 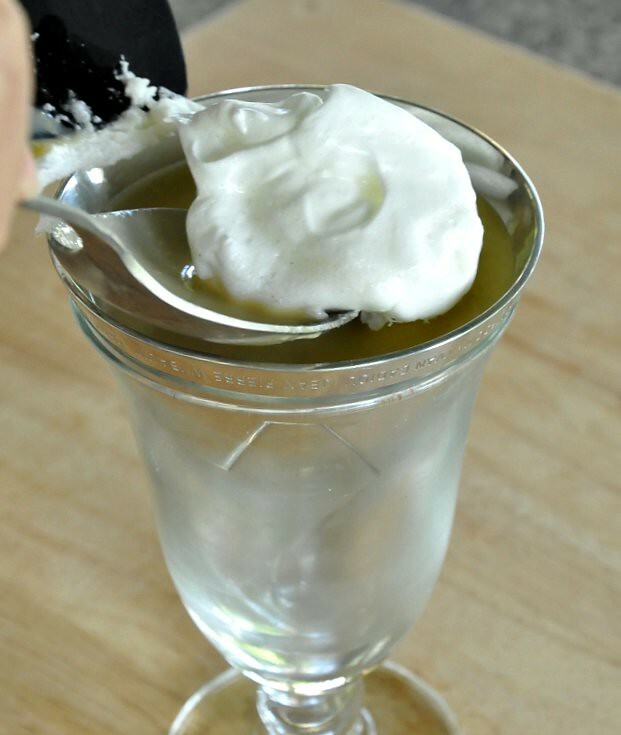 This is a simple but delicious dessert to serve after a heavy meal, especially for people who are watching their intake of wheat and other starch-based carbs. For the whole month of October, I will be using the Nick Munro moulds for RSP's Jellyrific! challenge to raise funds for the Breast Cancer Welfare Association Of Malaysia. Do make comments on my posts as I'm giving away an Oympus VG-110 camera. If you purchase one of the moulds (RM290/USD90) or spend RM500/USD160 on RSP products, you can even buy a vote (think charity) for your favorite blog plus stand a chance to win the Olympus Pen Lite E-PL3 camera! Check here for a durian that grows only on Borneo Island. is just the perfect size for one serving and it looks great too! 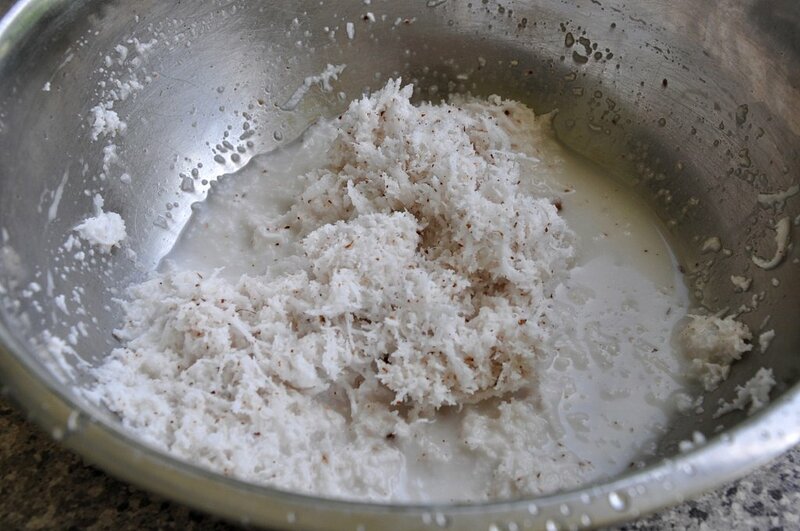 Freshly grated old coconut is mixed with some water to make coconut milk. 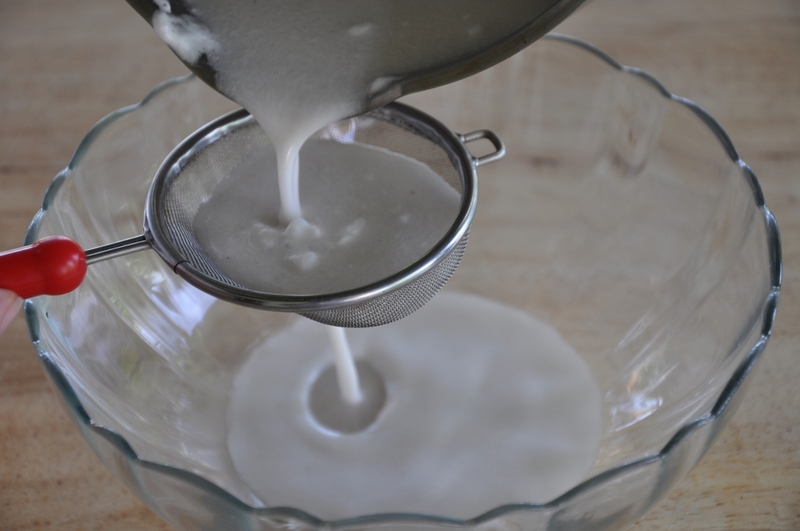 The coconut milk is strained. Pass the durian flesh through a fine sieve. 1. 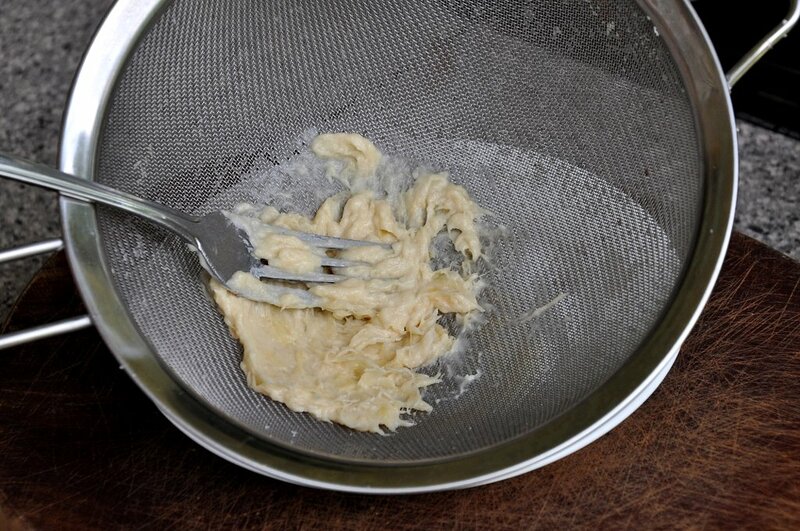 Press the durian flesh through a sieve to get a fine mash. 2. Heat the coconut milk until just about to boil (bubbles at the side of the pot). Cover and keep warm. 4. 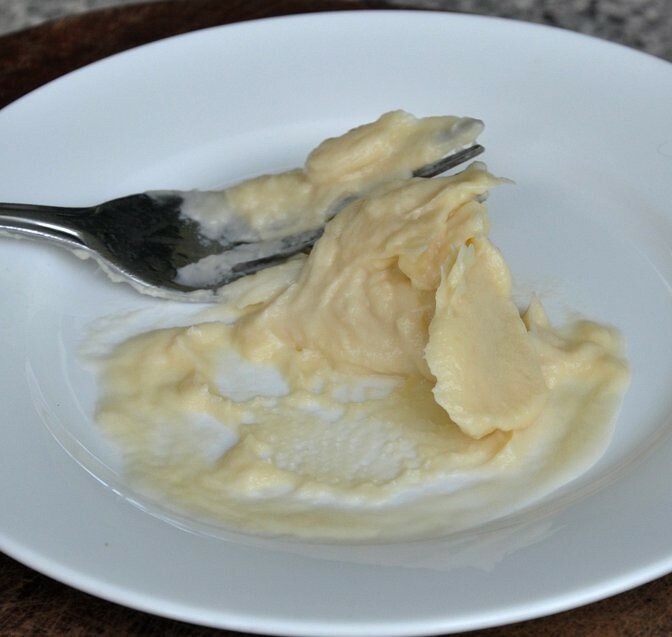 Put the custard mixture into a small saucepot and cook under low heat, stirring all the time, until sauce is thickened enough to coat the back of a spoon and will not merge after a finger is swiped through. Let cool and then chill. 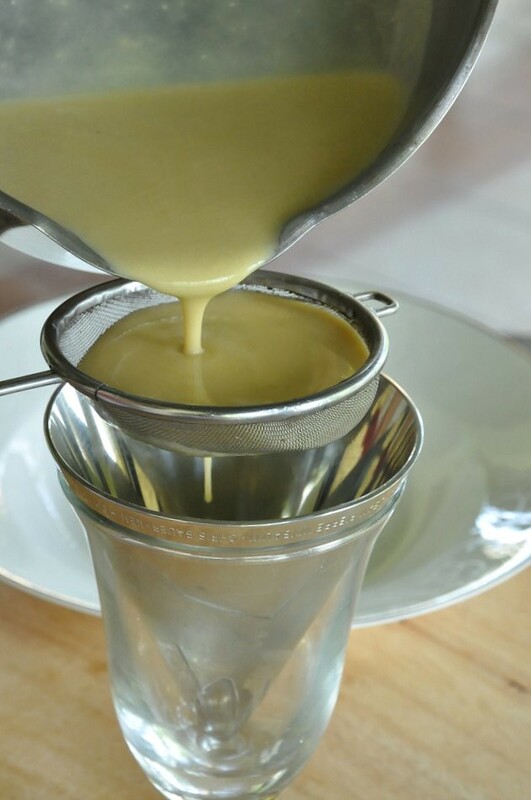 When chilled, if the custard tastes too rich and thick, add the extra regular milk to thin it out until it is the consistency of a soup that you'll like. 1. Oven at 100 C/200 F. Line an oven tray or Swiss roll tray with aluminium foil. 2. 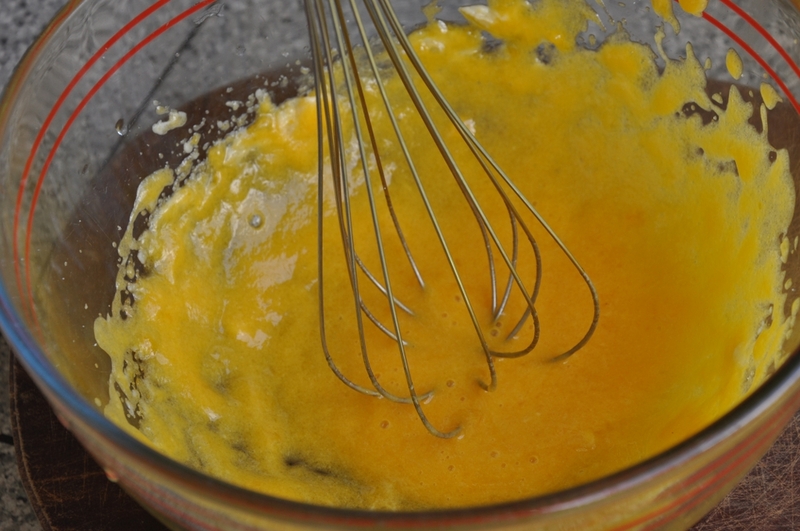 Whisk the egg whites with the cream of tarter for 1 minute, then add the sugar and whisk until stiff peaks stage. 3. 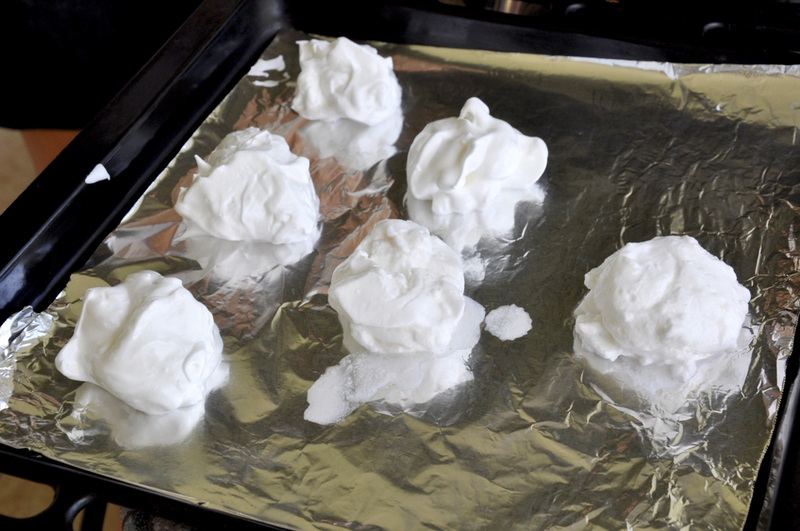 Using a large spoon, place dollops of the meringue on the prepared tray. Bake 15 minutes for a dinner spoon-sized meringue, longer for bigger meringues. Switch oven off and leave the meringues in the oven while you prepare the serving bowls. 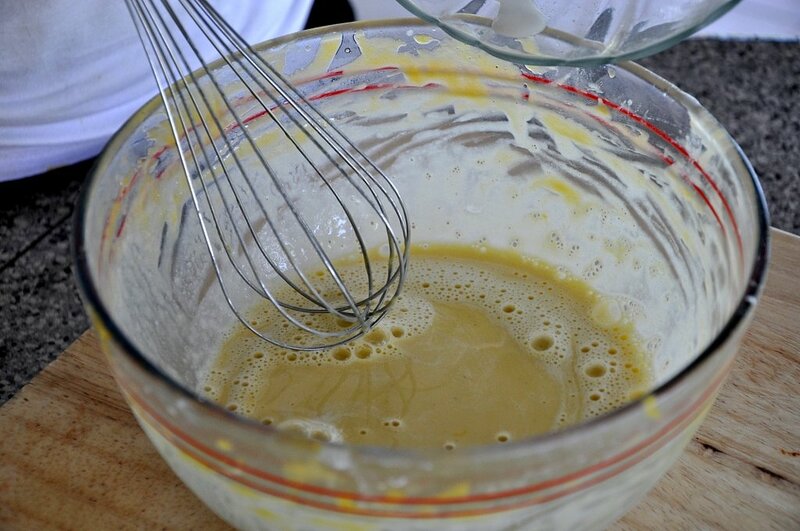 You can also scald the meringue puffs in hot milk before baking them but this is a tricky step. You've never failed to amaze me! Looking forward to tomorrow's posting. Keep it up! This competition is pretty exciting, even for a spectator like me. I like seeing something new every time I come here. 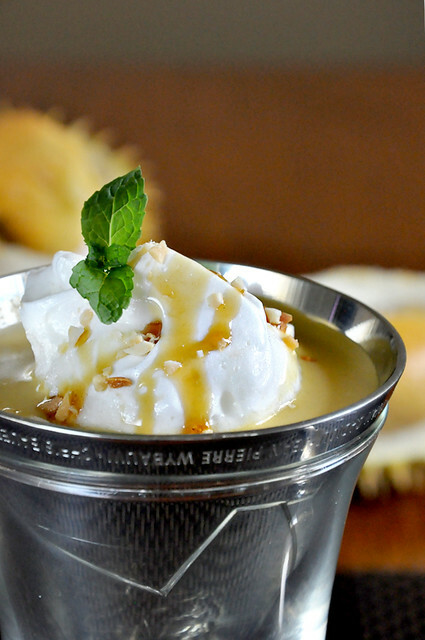 Wish I could taste that durian concoction! How about doing an M&M chocolate jelly? Or a cheesecake one? A chrysanthemum water jelly or "leng chee kang" one? Have not visited lately….. Wow! What a tasty looking desert! And for a worthy course 2! As I was wondering out loud what the name means, Alx who’s right next to me peaked over & blurted out something like “floating island”….sure enough, as I scrolled down, you’ve included the translation. Her high school French does come thru from time to time. I missed KK durian! Don’t much care for the frozen ones we get here. Am tempted to ask K to bring back some KK durian. BTW She’s in KK now visiting with her parents till this Thursday. Good luck w/ the contest! Duriannnssssss! oh how i love them *music playing* =D this recipe and presentation looks awesome. done with the king of fruit, what about the queen? some mangosteen cone jell-o will be pretty for reals!! looking forward to more special recipes. Great idea- using it as a serving bowl! i have never tried floating islands but am always intrigued when i see them on tv, i will have to add it my to-do list! Terri, you have done it again! So proud of you. Way to go! Terri! you ever fail to excite me with your wonder creation. Lov anything with durain. This is a cool idea of using the molds for serving. Wow, just can't help salivating! Gosh this one to doe for!